Wash the hibiscus flower and place in a pot. Pour 1 litre of water into the pot of hibiscus flower and place pot on stove to boil. Allow the pot to boil for 5 to 10 minutes. Turn off the heat and strain leaves from the juice. Add sugar (optional) and pineapple slices or flavouring (optional). Allow juice to cool down and pour in bottle or jug to store. 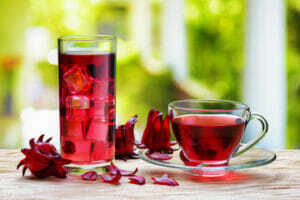 Store in fridge and enjoy hibiscus/zobo drink whenever.